I have one more PenBBS ink to try this week-137 Wisteria Sinensis. This sample was provided to me by Vanness Pens, the only retailer to carry PenBBS in the United States as far as I know. 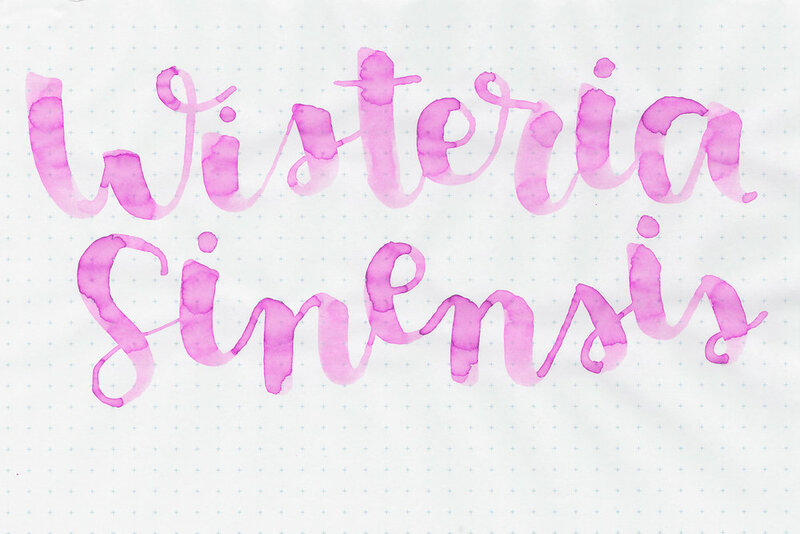 Wisteria is kind of a light magenta, not quite pink, but a very light purple. You can see the tiniest little bit of sheen on the edges, it's very faint. Please ignore the torn edge-tore it by accident. On 32 pound copy paper there is just a little bit of feathering in the broad and flex nib. Ink swabs for comparison, left to right (top to bottom for RSS mobile): Sailor Jentle Fuji-musume, PenBBS 137 Wisteria Sinensis, and Robert Oster Australian Opal Mauve. Click here to see the PenBBS inks together. Platinum Lavender Black, Diamine Amazing Amethyst, and Sailor Jentle Ultra Marine. 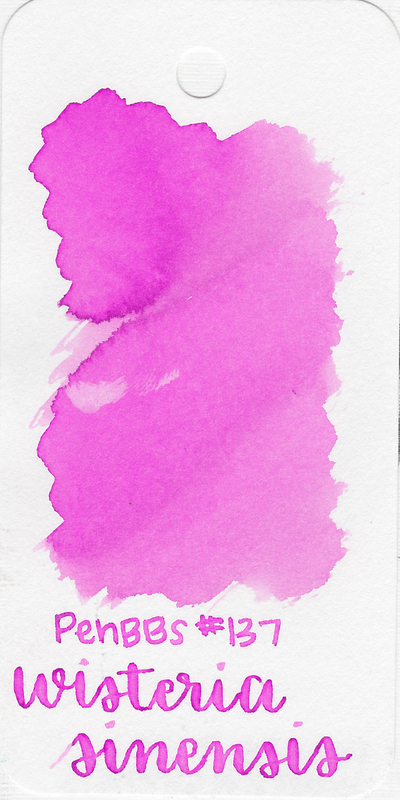 Click here to see the purple inks together. 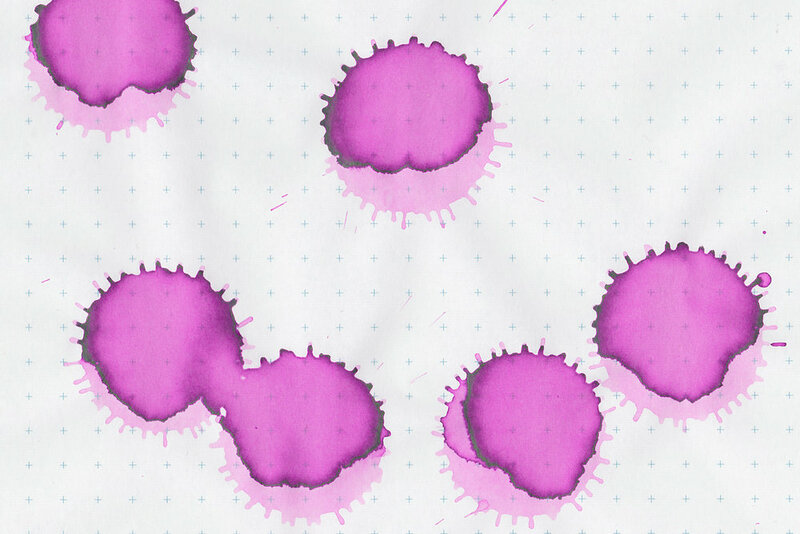 Depending on the lighting, the ink can look a bit more purple or a bit more pink. I used a broad Pilot Vanishing Point on Tomoe River paper. In the beginning, after I had freshly filled the pen, the ink flowed fine, but as I kept writing the ink seemed to be a bit drier than average. Overall, the ink is a bit too light in writing, and a bit too dry for me. It's not a bad color, just not the most practical for everyday use. Disclaimer: This ink was provided by Vanness Pens in exchange for an honest review. All photos and opinions are my own. There are no affiliate links on this page.